Xiaomi Product Director Wang Teng posted a simple photo on Weibo, showcasing some bottles in the discussion room at the Beijing HQ. However, in the background, a device with a pop-up camera was spotted, and later the post was deleted from the social media. Of course, you can’t merely click Delete and remove something off the internet, so check out the device in the background. The leak and its subsequent delete aligns with previous info that Redmi will announce a Snapdragon 855-powered device with an elevating selfie camera mechanism. Later, Lu Weibing, Redmi brand manager, debunked rumored images, saying the design of the new phone is nowhere near leaks from last week. However, if the phone in the deleted photo is real, we might be looking at the first Xiaomi-owned smartphone with such a technology. 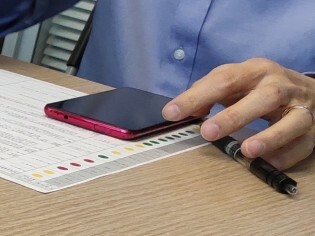 Even if it’s not a phone by the Beijing company, it sure is none of the other devices out there with such a camera, because the array of noise cancellation mic, 3.5 mm audio jack and pop-up mechanism are unique so far. Our Chinese is shoddy when a piece of paper is angled, upside-down and on an digitally zoomed image, but we are probably looking at features listed as “good to go”, “needs a fine tune”, “doesn’t work at all” in the whole green-yellow-red circle system, which is something a company would do if a new product is on the way.